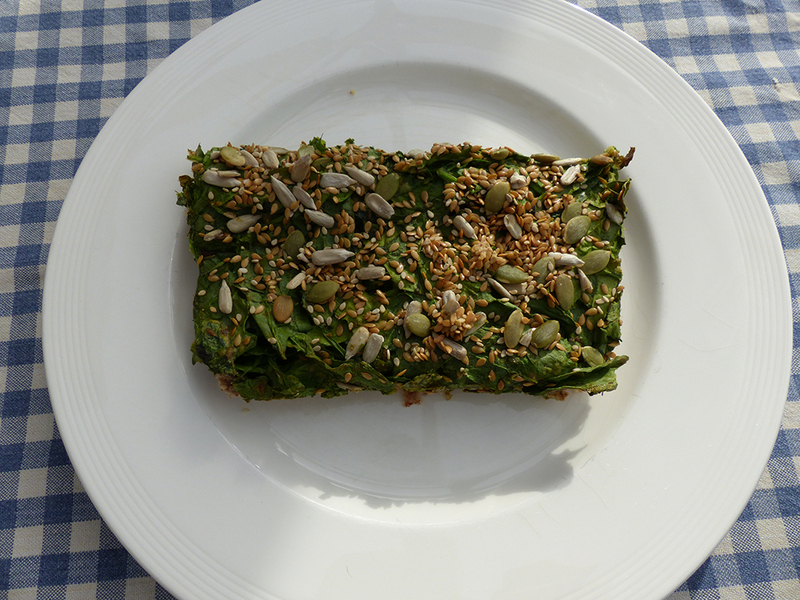 A healthy pie filled with omega 3 containing seeds, fibre rich avocado and it's gluten free too! Serve it with a side salad as all salad leaves are in season right now! Add together the ground almonds and hazelnuts and mix well. Add the corn flour, coconut oil and cold water and stir together until you’ve got a nice doughy consistency. Cover and leave to rest in the fridge for half an hour. Chop the spinach and remove the stone out of the avocado. To do this safely cut the avocado on both side across the long sides. Gently twist using both hands both sides until one it comes apart. One half will now have the stone in it and you can remove this with a spoon. You can now remove the avocado flesh with a spoon. Put the avocado flesh in a bowl and add the eggs coriander, cumin seeds and chilli flakes. Puree with a kitchen machine. Add the chopped spinach. Oil a round baking tin with some sunflower oil and add the nut dough. Level with the back of a spoon. Add the avocado/spinach mixture on top. Mix together the seeds and sprinkle these on top of the pie. Bake for around 25 minutes in a 190C (gas mark 5).